WIT has initiated work on some priority projects that we wanted to give you a brief introduction on each one below. We welcome business representatives to contact us to discuss further these Innovation Projects and any other concepts for the use of either the SG Gas or SG Gas-infused Water. Please call or submit your inquiry at the Contact Us Link of this website. Our first project was the issuance of a license to AquaNew, L.L.C. located in Sarasota, Florida to allow the use of the Technology to produce Ultra-Pure Polarized Water and distribute the bottled drinking water throughout the United States, under the registered trademark name of Watt-Ahh®, an AquaNew® Water. This Company has been selling Polarized Drinking Water since November of 2007. The AquaNew website is www.AquaNew.com that provides more information on the Polarized Water including clinical study results on the water quality, enhanced shelf-life for cut flowers, nutrient absorption, and increased plant growth. Our Discovery involves the creation of smaller clusters of water that promote more efficient inter- and intracellular absorption. 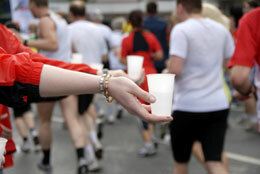 The human body must metabolize regular water which is estimated to take at least two hours after consumption. The Dioxytetrahydride or SG Gas-infusion of Ultra-Pure Water creates restructured, smaller clusters of water molecules thereby promoting a faster metabolism and absorption of the water molecules into the cells. Polarized Water contains no additives such as salts, minerals, sugars and caffeine that can disrupt the body’s ability to metabolize water. WIT is currently performing observations on athletes that report they remain hydrated longer while drinking less Polarized Water, experience greater energy without sugar or caffeine, and retain their mental clarity during performance of their exercise routines and sporting events. Additionally, we continue to monitor other reported benefits from individuals using Ultra-pure Polarized Water by either drinking or using the Water in humidifiers at night. These individuals are reporting less frequent migraine headaches, respiratory and allergy problems and seem to sleep quieter using a humidifier filled with Polarized Water at night. Drinking the Polarized Water and breathing the Dioxytetrahydride Gas appear to reduce heavy metals contamination in the human body. We have received testimonials from medical practitioners who report detoxification of heavy metals observed in either their patients or themselves. Several of these testimonials and related photos and videos are provided on the links below: One from a dentist and another from a doctor of alternative medicine. “I have been practicing dentistry for 50 years, and during that time I have ground out a lot of old silver fillings that were laden with mercury. I also had many of the same silver mercury fillings in my mouth. I have had all of them removed. About ten years ago, I went to Orange Beach, California to the Whitaker Institute for Preventive Medicine. I was told that I had more mercury in my system than they had ever seen. I was told that if I was to remove it through chelation that I would need to be very careful, it would be removed a little at a time and that it would also make me sick. There was no one in Georgia I was comfortable with to do the removal procedure. About four months ago, a group of preventive Doctors moved into Columbus that did chelation. I met Scott S. about this time and started your water and also had about four one to two hour sessions on your gas machine. When I went back to see them, they did what was called an IV push and I collected my urine for twenty four hours. I reported back to them and they told me all my mercury was gone. I am on a three month recall to check with them, again, to see if I am still mercury free. Note from WIT: Thank you, Dr. Joe. Please contact Dana Gourley at 941-923-8972 if you want to accept Dr. Joe’s offer to talk about his experience using the WIT Technology. Most diseases are water-borne and can start attacking at the cellular level. It is critical that water supplies do not become either contaminated or stagnant causing growth of harmful germs, molds and bacteria. There are many people that are not sustained by clean and reliable water supplies throughout the world. 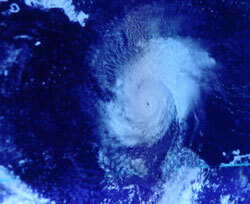 The problem is elevated when areas are devastated by traumatic events of hurricanes, cyclones, earthquakes and tsunamis. WIT is conducting shelf-life studies on the Ultra-Pure Polarized Water to demonstrate that it remains purified and stable in storage beyond the two-year recommendation for other types of water. In-home devices could be designed and produced under a licensing arrangement to provide an on-demand, safe water supply. Containers of Polarized Water could be stored and used during times of crisis. WIT is dedicated to clean water supplies and remains open to collaborating on this critical issue with governmental emergency management programs. Ultra-Pure Polarized Water, infused with SG Gas, has some healing properties. This Water hydrates while regular water can dehydrate the skin. This is demonstrated with wrinkled skin on our fingers when we come out of a shower or swimming pool. We predict that a hydrated state for skin from emersion or spraying with our Ultra-Pure Water will assist in alleviating pain caused by burns, insect bites and scrapes. The throbbing of pain may be alleviated if locations of the damage (or barriers) are hydrated to allow a more normal flow of nerve sensations. Wounds may heal quicker since the Ultra-Pure Water permeates cells and removes toxins. We predict that the hydrating nature of this Water triggers collagen and the human growth hormone to initiate the respective healing and soothing properties. We have received testimonials from individuals that report almost immediate pain relief and healing over the period of several days when the wound is soaking in SG Gas-infused Water. Several of these testimonials and related before/after photos are provided on the links below: Two horse veterinarians in Va., one medical doctor in Texas, Joe, E.Y., John G., Dave D., Michael K, and Scott's testimonials. 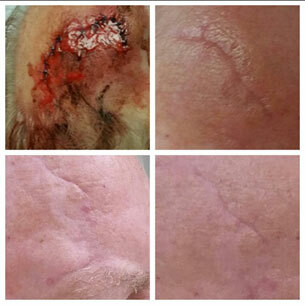 Warning: the photos on bloody and flesh-eating bacteria wounds are graphic in nature. Recovery from a motorcycle accident by a man (my friend) who suffered multiple broken bones and a major trauma to the back of his lower leg. 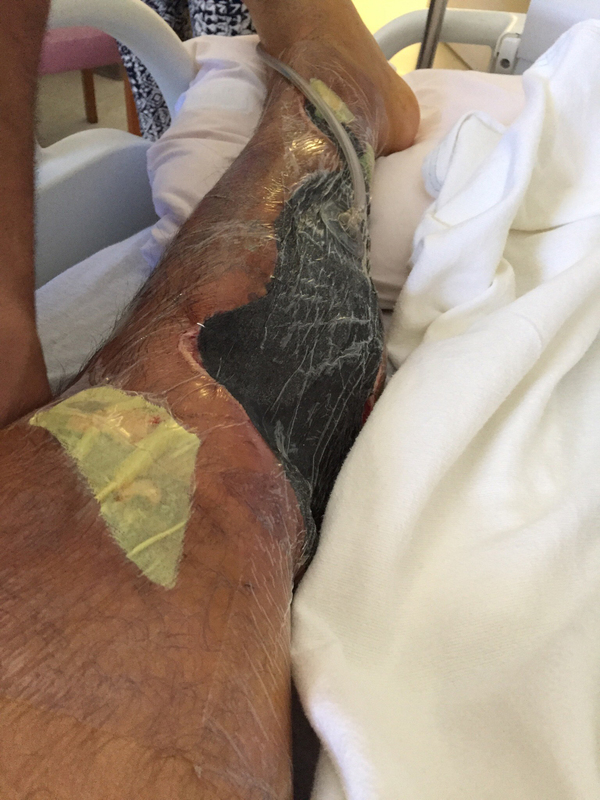 His doctors were preparing for amputation of his leg due to gangrene. It appeared that the gangrene subsided in five days after the man began drinking and spraying the Polarized Water on his wound site. The surgeon repaired the fractures in his leg. 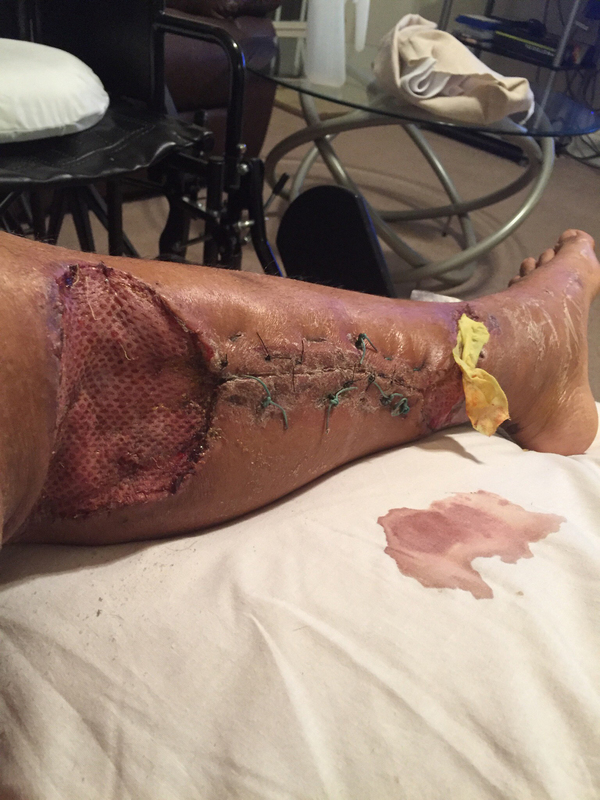 A photo of the man’s leg before he started using the Polarized Water and after photo of the wound site (drinking and spraying the Polarized Water) are shown below. My friend is recovering at home with no loss of limb. December 1, 2015: Patient accidentally severed the tip of her finger. December 2, 2015: Patient underwent surgery for reattaching the severed tip to her finger. December 18, 2015 (seventeen days after replant repair surgery): Dr. Lomax expressed concern to AquaNew, LLC (manufacturer of Polarized Water) over the slow recovery and possible second surgery to debride and explore the original replant repair by Patient’s surgeon. He requested Polarized Water to be sent to Patient so she could soak her finger. December 22, 2015 (twenty-one days after replant repair surgery): Patient received the Polarized Water and began soaking her finger. On or about December 28, 2015 (six days after soaking finger in Polarized Water): Patient’s daughter called and reported that Patient’s finger is looking better and she has feeling back in the tip of her finger. 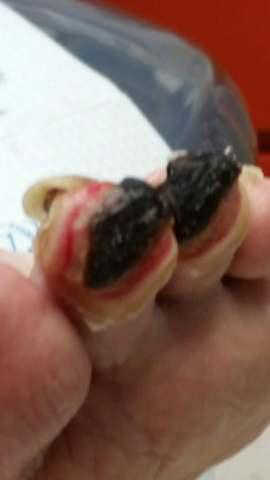 "On December 1, 2015 I was advised by a friend that her mother had her right 5th fingertip caught in a door while at work and partially amputated. Surgery to repair the damage and replant it was performed on December 2, 2015. Several days later her daughter voiced concerns about the follow up care that was being provided e.g. the dressing was removed by the worker's compensation physicians I believe on postop day 1, and the wound exposed to some type of cleaning. This is generally frowned upon by hand surgeons e.g. the dressing should be left untouched until the first postop visit with the operating surgeon to minimize the risk of complications e.g. infection. By the end of postop week one she still had not been given an appointment to see the operating surgeon. Into postop week number two she finally saw the surgeon who voiced concerns that her fingertip appeared to be dying and that another surgery was necessary. I was advised of this and recommended that her mother begin soaking her finger in Aquanew several times a day, keep the dressing semi-saturated with Aquanew especially overnight while sleeping. After beginning to utilize the Aquanew she began to heal quite rapidly. Evidence is seen in the series of photographs obtained pre-Aquanew utilization when her fingertip was clearly becoming necrotic and dying, and over several weeks where clear and rapid tissue healing can be appreciated. Aquanew was clearly the cause of this. Aquanew was able to stimulate the body's ability to heal in a more rapid fashion which has essentially saved her fingertip. The healing characteristics and potential of Aquanew in the areas of wound healing and potentially tissue regeneration are nothing short of phenomenal." "I believe that the Polarized Water has been a help in my dad's progress. They wanted to cut off his toes." 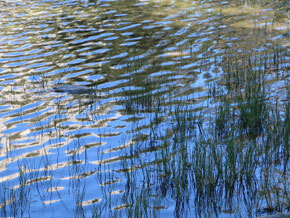 I would like to share one of my Ultra-pure Polarized Water experiences! On Feb 22, 2015 I was involved in a motorcycle accident. One of the injuries I sustained was a substantial head injury. The skin was ripped to the skull on my right side forehead in a very jagged fashion and dragged back towards my ear. Thank goodness I had a pro-team that worked diligently to get my flesh as close to pre-accident status as possible as you can see in the picture. This is where this Ultra-pure Polarized Water experience began! One week out of the accident I contacted Dana and Rob ... I've seen the ugly book and I knew the healing power of the Ultra-pure Polarized Water! 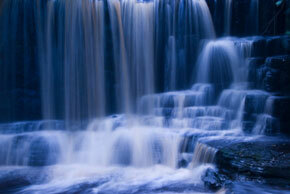 Rob suggested to keep the area saturated as possible with the Ultra-pure Polarized Water. Managing that wasn't easy for me. I just had 13 pins installed in my right clavicle and my left hand was in a cast. The only answer that worked for me was a bandanna stuffed with bandages. Throughout the day and night for six weeks I kept the area as saturated as possible plus I drank at least one liter per day of the Ultra-pure Polarized Water. It is hard to explain but each time I saturated the area I could feel what felt like a mild electrical current in the wound. 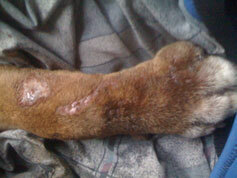 At the end of the six weeks the wound had completely healed up. I still had a pretty large scar but my doctors were amazed at how much the wound had healed in such a short period. Over the next 60 days (I took pics in 30 day intervals) the healing continued and the scar reduction was dramatic. During this period I combined the Ultra-pure Polarized Water with a lotion product containing aloe vera and oleander extract that I continue to use today six months later. Today the scar is barely visible. The proof is in the pictures. Thanks Rob and Dana! The Polarized Water is an absolutely amazing wound healer! John G. of Sarasota, FL. On December 24th I cut my hand with a 4" grinder with a chainsaw blade. The photos were taken between December 24th and January 31st. For the first 2 weeks I used the Ultra–pure Polarized Water. I bathed my hand 4 times a day for 15 minutes. I had 2 surgeries and 27 stitches externally and 8 internally on the wound. Since I was released from the hospital I have not seen a doctor. I took only 4 antibiotic pills due to the fact that I hate swallowing pills. I pulled my own stitches and did everything opposite that someone would do in my situation! I have full motion in my fingers and thumb. I would say in 5 weeks after the accident, I'm 97% healed. Thanks to God and the Water. Fluffie is a 15–20 year old Thoroughbred retired broodmare that lives at a well–managed farm. 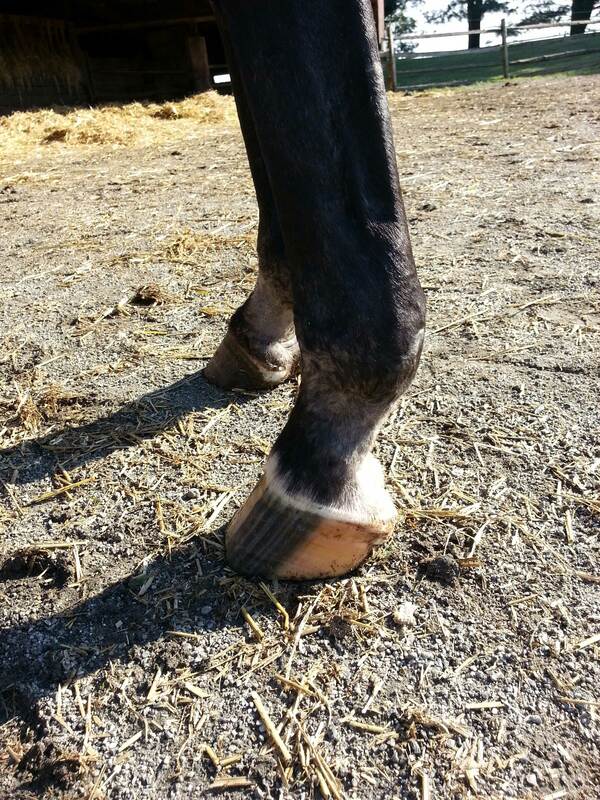 Since acquiring the mare many years ago (over 5 years), the owner indicated that Fluffie has always suffered from chronic scratches or caudal pastern dermatitis of both hind legs. Occasionally, this will develop into a cellulitis or lymphangitis. The condition is managed topically with disinfectant (nolvasan, betadine, malaseb) shampoos followed by antibiotic/desitin creams +/- bandaging and hair clipping. Over the years, Fluffie has been treated with every antibiotic under the sun including naxcel, gentamicin, TMS, and doxycycline. Her manager does not seem to think antibiotics help much with the primary condition, although they are sometimes needed to control the cellulitis. This summer (2013), the condition has been worse than ever before (we have had a very wet summer in Virginia). I saw the case for the first time on 7/2/13, and it is easily the worst case of scratches I have ever seen. There was extensive lichenification of skin, oozing cracks, and thick crusts. 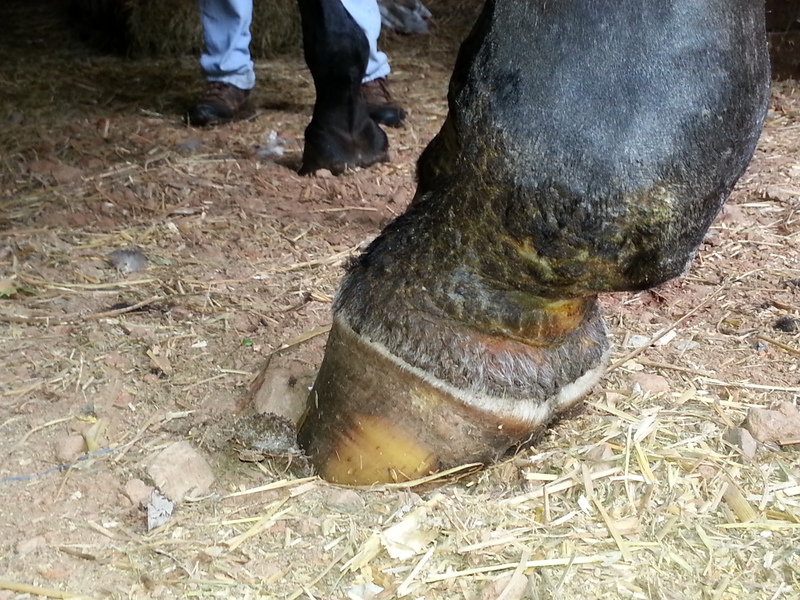 The condition has not responded well in the past to either antibiotics or steroids. It is not seasonal or pruritic. Interestingly, the owner thinks the condition looks the best when there has been a deep snow (the mare lives outside). I took pictures and submitted a skin culture and biopsy to Cornell University for a more accurate diagnosis of the problem. At the suggestion of another veterinarian, the owner began using the restructured Water on Fluffie's legs with impressive results. At the owner's request, the manager began washing the legs daily with the ketoconazole–chlorhexidine dermatologic shampoo, rinsed, dried, and sprayed on the restructured Water to saturate the skin, then bandaged the limbs with clean cotton wraps. The owner also gave a few doses of dexamethasone–chlopheniramine over the next few days. 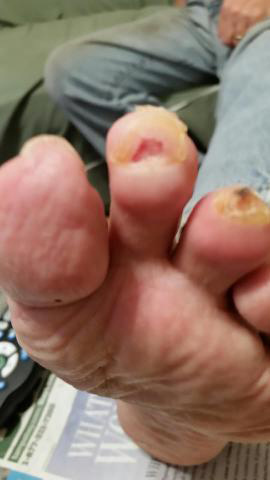 No systemic antibiotics were given, despite obvious cellulitis and secondary skin infection. I saw the mare on three more occasions (7/12/13, 7/19/13 and 8/2/13) and photographically documented her progress. I am not sure what the mechanism of action is, by the restructured Water, in addition to the otherwise routine management of scratches, seemed to significantly help this case. In August 2008 I fell off a horse and got a small splinter in my thumb. Within a few days my thumb had become really sore. I went to a medical centre who cut the thumb with a scalpel and gave me antibiotics. Two days later, I was admitted to the hospital for an operation on what I was told was a pulp space infection. The following day I discharged myself and went to a hospital in Winchester, England where I live. I was admitted there for another week in which time I had another 3 operations. After the second operation the surgeon told me that the infection was extremely aggressive and that I may loose my thumb. The 3rd operation was successful and I left hospital with my thumb still there although it had been cut away quite a lot. 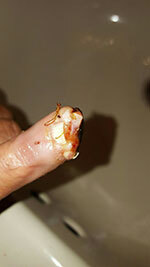 I left hospital in September 2008 and most people who saw my thumb thought it had been attacked with a chainsaw! My doctor advised me that it may take several months to heal over, and during this time my thumb continued to look horrific, to anyone who saw it. In November 2008, I travelled to Bradenton, Florida for a convention on Hydrogen Systems because I had been working on a system in the UK and was keen to find out if there had been any major development of this technology in the States. Unfortunately it transpired that there were no major innovations that came to light at this seminar. Fortunately for me however, I happened to be sitting in front of Rob and Dana Gourley, owners of the company AquaNew. After the seminar I started talking to Rob who explained about the development of a ultra-pure water product which had a different molecular structure to normal water. Chemistry is not my strong point but Rob seemed to be on a different level to any one else in the room. Dana then noticed my thumb and I told her the story of my splinter. She immediately said that they would give me a bottle of ultra-pure water. She explained she is not a medical doctor but some of their customers have experienced healing by soaking in this water 4 or 5 times a day for about 30 minutes. I took the water with me and considered what it could do for me, realizing that it is ultra-pure water and would not “undo” the treatment I had already received, although my thumb still looked very bad and I did want to get it healed (It was still looking horrendous as you can see in the pictures). When I arrived back at my sister's house in Winter Park, Florida I immediately soaked my thumb for 30 minutes. I repeated this over the next couple of days. The results within 3 days were nothing short of miraculous. Most of the scabbing and damaged material was gone to leave a fresh layer of skin. I immediately drove 2 hours back to Sarasota, Florida to buy some more bottles of ultra-pure water to take back to the UK with me. I continued to use the ultra-pure water for another week and the healing continued. I went back to hospital in late November 2008 and my surgeon discharged me with no further treatment required. I still obviously have scarring but I was amazed at how quickly my thumb healed after using this ultra-pure water. I don't profess to know how this ultra-pure water works but I do know that it does. I wish AquaNew every success with their product which I'm sure will be many benefits to many people. Regards Dave D. of U.K.
My dog, Diesel, sustained bite injuries which we thought were the result of a snake, spider, or some other insect, which caused swelling and infection to take place in Diesel’s leg. As time went on, the “bite” area became more swollen and infected, however, a friend told me about the Ultra-pure Polarized Water that he had used to soak and wrap his dog’s injured leg, and he recommended that I try this. 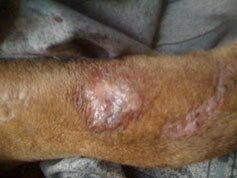 I did as my friend suggested, and within two days, Diesel’s leg began to heal, with reduced swelling. I have provided photographs of Diesel’s injury area, after two days of treating with a dressing soaked in the Ultra-pure Polarized Water. I’m thankful to have been told about this Water, and I’m sure Diesel is too! More Scientific Theory on Healing and Pain Relief: Polarized or SG Gas-infused Water is a made from pharmaceutical grade water, and is then infused with a patent pending water gas that contains reconstructed water molecules that are both paramagnetic and ionized. Clinical tests have proven the absorbency rate is four times greater than that of standard distilled water, with or without salt additives. Polarized Water can be used for topical application. Research has shown that healing of multilayer burns, for example, relates directly to the degree, severity of the burn, as well as the total body area encompassed by the burn. Additionally, the amount of nerve tissues present at the site and the electrical potential difference between the site surrounding intact tissue, which is sometimes referred to as the current of injury, controls the extent of severe pain experienced by the patient. Specifically, any burn injury pain is the result of changes in the electrical signal at the site of the injury, stimulating complex cellular responses to promote healing. Electric fields eventually return to normal as the injury heals. However, in the absence of appropriate electrical signals, the injury site will not heal properly and the risk of infection is paramount. Because of the antimicrobial and antifungal properties of Ultra-pure Polarized Water, we believe it will eventually be widely used in all areas of burn treatment. The effectiveness of Polarized Water as an antimicrobial agent is at least partly determined by the delivery system, which is topical, in the case of burns or cuts, and can penetrate deeply into the tissues, which is effective against antibiotic-resistant strains of bacteria and fungi. Polarized Water may be applied topically, or the injured area may be submersed into the Polarized Water for immediate pain reduction-elimination, and the absorption properties allow it to be carried as an anti-bacterial agent to stimulate wound repair at the surface and immediately adjacent tissues. Sterile gauze soaked in Ultra-pure Polarized Water maintains fluids at the skin surface for treatment of burn patients and keeps the area free of contaminants. Further, Polarized Water’s non-adherence to a wound or burn site is crucial to minimize the pain associated with the removal of dead tissues for which painful debridements are otherwise required. By simple dressing changes, dead skin is sloughed off, which minimizes the wound trauma and the associated risks of infection and delayed healing. These simple dressings, using only sterile gauze and Ultra-pure Polarized Water, will promote healing with antibacterial and anti-fungal efficacy. When Ultra-pure Polarized Water is applied topically to the skin, and the pain stops, it's because the electrical pulses are conducting across the area where the cells are damaged and are able to communicate. The current of the injury or electrical nerve pulses are no longer interrupted. In simple terms, the brain sends out a signal through the nerves to the cell, and the cells also send back a signal from the cells to the brain. If this communication is disrupted at the damaged site, the pain, and/or the loss of feeling or movement will return. Nerves are simply the electronic pulses that go through the body. The brain communicates with different parts of the body and the cells also communicate with each other through electrical current. Anytime damage in the body from burns, cuts, or other reasons occur, there is an electrical opening because the “electric circuit” is broken, and the cells are not communicating with one another, once they start communicating with one another, they send a signal to the brain, and the brain, in turn, causes the body to produce stem cells. Stem cells come in through the blood that's accumulated and begin to grow to fill in this gap. That's what we call healing. The stem cells grow and bridge the gap between the good cells on both sides, then they start to communicate with one another again, and once they communicate with one another they know that healing has taken place and the stem cells growth stops. Continued Theory on Cancer: Now, when the cells are so toxic they lose the ability to communicate properly, the stem cells come in, the growth starts, and it keeps going. The cells on the side are so toxic they can not communicate properly; therefore the growing continues. This is a malignant growth, it is part of the healing response gone badly. Cancer of the heart or skeletal muscles does not occur. These types of cells are not toxic, since they are constantly being replaced and they do not build up toxins like other organs. Heart and skeletal muscles do not lose cellular communication or current of injury. So when the stem cells fill in the “wound” gap they can communicate with each other and shut off stem cell production and shut off growth. Continued growth causes a malignant tumor, which breaks off and creates metastasis that flow through the blood to other parts of the body and attach to other organs where tumors grow, and it is all because the cells are not able to communicate. When cells are flushed to get rid of all the toxins, the cells begin to communicate properly again. Vitamins and minerals are necessary in the body, but not at the level most people consume them along with the by-products of most medications which are harmful. Excess substances in the body can make cells oversaturated resulting in communicate problems. The liquid in our body has a saturation point and the excess nutrients and byproducts of medication begin to separate and fall out. Once that occurs, there are no more reactions that take place. Water is the liquid that carries the message because it carries the electrolyte solutions that transfer the electrical current, and that's the way all the parts of our body, our cells, and brain communicate with one another. It all begins with a liquid. This process stops pain and promotes healing in several ways. The paramagnetic and ionized nature of the Ultra-pure Polarized Water lowers the capacitance of the solution, allowing for better communication between nerve endings and cells that lowers the pain and promotes healing. Based upon pre-clinical trials, SG Gas-infused Water provides greater absorption nutrients and vitamins when compared to that of either tap water or filtered water. Preliminary results evaluating the cellular absorption of various intestinal surfaces demonstrated a substantially greater absorption of Vitamin C with the use of Polarized Water. Even a small increase in absorption of vitamins and nutrients is a benefit in sustaining healthy cells, enhancing metabolism for optimum energy, and safeguarding the effects of premature aging and disease. Additional clinical testing is on-going. transport of Vitamin C and Iron. Click here to learn more. The WIT Team, in collaboration with a licensee company AquaNew, L.L.C., has observed increased plant and fish growth and improved taste in foods which opens the world of possibilities in applying SG Gas and SG Gas-infused Water into agricultural and food production including fish farms. As indicated previously, AquaNew, L.L.C. 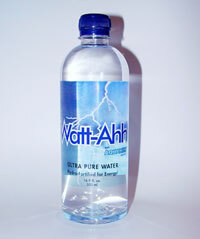 located in Sarasota, Florida, has licensing rights to produce SG Gas-infused Water under the brand name of Watt-Ahh™, an AquaNew™ Water (www.AquaNew.com). The water is being combined into beverages, health drinks, food, and nutritional products, and initial shelf-life studies for the majority of these products are showing successful results. As part of our collaborative investigations, a plant growth study revealed a 16% increase in dry biomass for ivy plants grown in a greenhouse using the highest concentration of SG Gas-infused Water when compared to that of lower concentrations of SG Gas-infused Water and only well water applied to similar ivy plants. Polarized Water has other beneficial properties that significantly reduce scale and algal growth in hydroponic containers. In a study involving fish in an aquarium bubbled with SG Gas, it was observed those fish grew larger when compared to same species of fish in an aquarium bubbled with air over a period of thirty days. Additionally, it was observed the water was visibly cleaner water with less algal growth in the aquarium bubbled with SG Gas. Food and beverages prepared with SG Gas-infused Water, also available under the brand name of Watt-Ahh™, an AquaNew™ Water (www.AquaNew.com), have a more robust flavor including hydroponic herbs grown in SG-infused Water. We intend to continue nutritional value comparison testing that includes wheat grass to determine whether or not the Polarized Water improves the beneficial nutritional strength of juiced wheat grass drinks and other antioxidant juice products. In addition, we will continue to perform fertilizer absorption rate testing and related plant growth studies using varying concentration mixtures of fertilizer and Polarized Water under the brand name of Watt-Ahh™, an AquaNew™ Water. One of the major challenges in the pharmaceutical industry is to find safer delivery systems for medication, without the potential harmful side-effects associated with some of the known “medication carriers” or “delivery systems”. These carriers, upon absorption in the body, may morph into a different chemical structure, becoming difficult to eliminate from the body. The detoxifying nature of the SG Gas-infused Pure Water may assist in cleansing the body of these chemicals after medication intake. 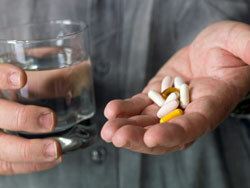 For certain medications such a Coumadin, physicians routinely adjust prescribed dosage amounts for their patients. The effectiveness of Coumadin is affected by the patient’s diet, weight fluctuations, and other lifestyle changes, and requires the patient to follow a disciplined blood testing regime. Another challenge in the pharmaceutical industry is that most patients are adverse toward injections and prefer instead, oral intake for their medicine. Insulin is injected into the body, in order to regulate blood-sugar levels in diabetic patients. Heparin may be a more reliable drug when compared to that of Coumadin, but the injection delivery typically is not well-received by patients. Patients, particularly those in the United States, prefer less intrusive means of medicine delivery such as oral intake but that option may not be available for some medicines to be effective. However, there appears to be an emerging trend in the medical field, toward a low intrusive alternative of “nebulizing” or inhaling medicines. SG Gas may have a significant role in addressing some of these pharmaceutical challenges. It may be clinically proven that SG Gas-infused Water is an effective means for detoxification of medicine by-products for elimination from the body. Additional testing may confirm reports from individuals drinking the Water, that their prescribed medicine dosage has been reduced by their physicians after evaluating the patient’s improved blood tests. Additionally, medicine delivery systems using either SG Gas or SG Gas-infused Water may preclude the necessity of combining medications with potentially harmful or toxic additives, in order to introduce the needed medication to the body. With SG Gas and SG Gas-Infused water, new possibilities exist for the efficient delivery of medications to the body, without the necessity of needles or injections. Whether or not SG Gas-infused Pure Water provides improved efficiencies in medicines such that dosages can be reduced by physicians, as reported by some individuals drinking the Water. Cosmetic chemists are performing on-going testing on the combination of SG Gas-infused Water with various moisturizing formulas for skin, scalp, and hair. Initial findings reveal that use of such combinations on facial areas, provided for a reduction of fine lines, as well as lighting of darker skin pigmentation under the eyes, together with a more hydrated and healthier appearance. Also, because of the purity level and bonding structure of the SG Gas-infused Water, there is a theoretical natural preservative component which has yet to be fully tested. Theories suggest that the restructured bonding of the hydroxyhydrogen molecule, creates an environment in which germs and bacteria cannot survive. We will continue testing and collaborating with cosmetic chemists, in light of the demand within the cosmetic industry for parabens replacements. (*Parabens have now been banned in Europe, thus forcing cosmetic chemists to pursue alternative methods for preserving botanical cosmetic formulations). Water is the primary cleaning agent, not detergent or soap. Emulsifiers and surfactants in detergents and soaps only modify water molecules to allow improved penetration into cloth fabric for removal of dirt, stains, oils, bacteria and other deposits bound to its fibers. The polarized characteristics and smaller molecule size of SG Gas-Infused Water enhances the effectiveness of detergents and cleaning formulations to more thoroughly penetrate cloth fabric. When laundering clothes, the addition of SG Gas-Infused Water to rinse water, completely removes soap residue, including residual dirt, body odors, lint, hair and pet fur from the fabric. White clothes come out of the dryer, looking bright and new without dingy grays. Mixing the Water with stain removal solutions enhances the complete removal of stains when the clothes are washed. 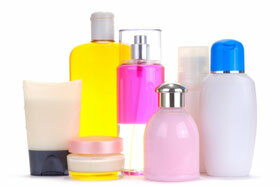 Many people suffer from allergies over household cleansers. Others have concerns about cleaning chemicals impacts on the environment, including their homes. The potential for all phases of household cleaning, with the use of lower amounts of harmful chemicals, is a market unto itself, particularly used in food preparation areas, childrens’ play areas, bathrooms and nurseries. Polarized Water alone has somewhat of a “magnetic effect” in lifting dirt and oil from surfaces and attaching onto cleaning cloths and paper towels. The Water’s effectiveness for cleaning seems to be enhanced with the addition of a small concentration of a cleaning fluid or oxidizing powder thereby reducing the use of emulsifiers and other harsh chemicals to cut grease and oil and remove dirt. WIT and its corporate partners will continue to run trials on the extra cleaning and sanitation attributes of Polarized Water including in homes, hospitals, offices and other environments. Another cleaning aspect of Polarized Water involves teeth brushing and mixing Polarized Water with mouthwash to dislodge plaque from teeth surfaces. We also predict Polarized Water may assist in moving plaque that has accumulated in blood vessels; however, clinical testing is required to substantiate this theory. 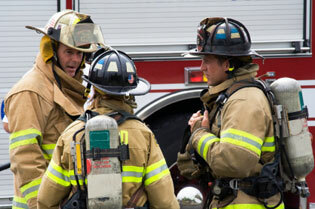 One potential use of SG Gas is for firefighters to breathe it after inhalation of extinguishing fires. Inhalation of SG Gas should reverse some of the carbon lodged in the lungs of firefighters and people exposed to cigarette smoke. SG Gas is an ionized gas capable of oxidizing or reducing almost any material without the adverse reactions created by heat producing flames. As such, when passing carbon materials (including emissions), through a simple ring-burner of SG Gas, very little energy is used to create a surface reaction on the substrate (materials) which takes the substrate surface to its oxidation point, thus causing melting or sublimation. Simply put, SG Gas will melt and vitrify organics, such that all, or nearly all pollutants will become solids that are heavier than air, and which will drop into a receptacle for collection. In this manner, various applications may be created for the reduction or complete discontinuation of toxic emission release into the environment. It should also be noted that the carbon solids collected from this process, are likely of greater value than the industrial process itself, which is creating the emissions. Globally, clean water is a precious commodity. Did you know that the typical Saturday afternoon wash of your car can waste in excess of 100 gallons of drinking water combined with soap, oil and grease and heavy metals washed down the storm drain? Weekend car wash fundraisers, as well intended as they are, result in thousands of pounds of heavy metal, grease and oil pollutant runoff into local rivers, streams and bays damaging sensitive and often already stressed ecosystems. Professional carwash facilities no longer indiscriminately allow water to drain into the storm sewer and most include reclaim and water conservation measures as part of their operation. Operators of other water-related businesses, including municipal water treatment systems, also implement new water conservation innovations Over the past few decades, these operations nationwide have become more eco-friendly due to higher water and sewer rates, higher utility access fees, local drought conditions, and mandatory water use restrictions. SG Gas Technology can cleanse water for reuse with cost savings on reducing the use of expensive water treatment chemicals and lower waste water bills. Check out the video that presents the H2O RenewTM System.